Balladeer’s Blog has often covered the Faculty Lounge Fascists who pretend to be “educators” (LMFAO) at American colleges and universities. Those secular missionaries for the Democrats are either Left-Wing Archie Bunkers from the 1960s generation OR had the misfortune of being “educated” (LMFAO) by Left-Wing Archie Bunkers from the 1960s generation. Call them what you will but they continue to stand athwart the maturation process crying “halt,” to twist a very old saying. Below is a link to an article by Teresa Mull who discusses the closing of young minds on American campuses. My disgust with American Liberals and Conservatives is no secret by this point. Like so many of us I used to identify as a Liberal until they became as intolerant of free speech and opposing viewpoints as the worst Christian Conservatives had ever been. The American Left has also proven to be hypocritical about blacklisting and political witch hunts, since they are more than happy to destroy lives in their obsessive targeting of anyone who disagrees with them. It’s no secret that American Liberalism has alienated countless former allies with its insane fondness for ONLY the most backward, misogynistic and homophobic elements of Islam. Not only do Liberals pompously dismiss Muslims who embrace the West and the 21st Century as “Western Triumphalists” who have “internalized Western oppression” but Liberals have also become THE biggest obstacle to adult discussions about Muslim violence. ALL attempts to discuss Muslim violence get stagnated at the simple-minded pee-pee ca-ca level because American Liberals always think they’re being deep by pointing out the obvious – that not all Muslims go around killing people. Well, not all gun owners go around killing people, either, but you’ll never hear Liberals saying that means we should NEVER discuss mass shootings. But hey, it’s not news that American Liberals are spineless hypocrites. Even though it’s a given that not all Muslims are terrorists the shallow, preening jackasses of the American Left STILL act like they are bringing some heavy-duty thinking to the argument by reciting that same tired refrain over and over again. That’s because American Liberals care only about their own egos and their pretensions. In their adolescent drama-queen minds they think they’re fighting battles of the past. Battles whose outcomes are already known. MUSLIM VIOLENCE AWARENESS YEAR CONTINUES! 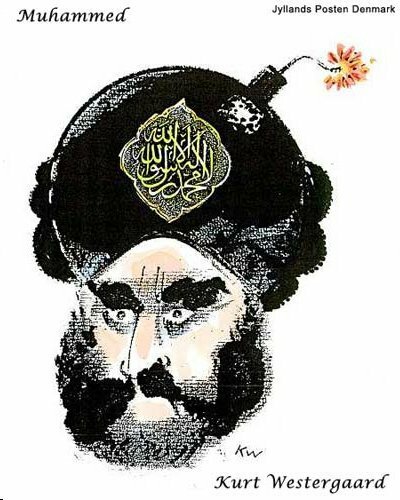 It’s entertaining listening to the hypocritical sniveling of people who are far too cowardly to criticize the violent fanatics of Islam. The more that the latest Muslim atrocities (and they perpetrate atrocities every single day) highlight the cowardice of their enablers the louder those gutless hypocrites howl in an attempt to deflect attention from their own craven behavior. Here are some quick smackdowns that let you, too, join in the fun of casually dismissing the wimpy excuses of these would-be Kapos who hope Muslim fanatics will attack the rest of us first. 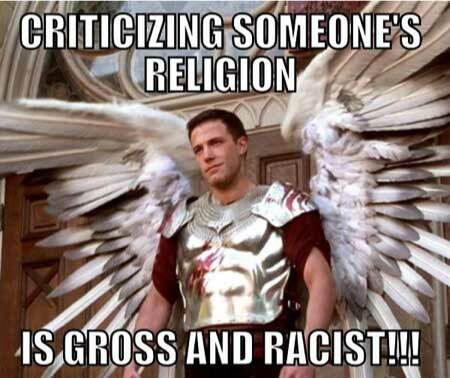 Gutless hypocrite Ben Affleck was happy to criticize Christians in the movie Dogma but crawls for Islam. GUTLESS HYPOCRITE COMMENT: Dude, like, we shouldn’t like, let the actions of SOME Muslims, like, color our feelings about, like, all of the Muslim world. GUTLESS HYPOCRITE COMMENT: Dude, it is so totally not awesome to, like, discuss actions that would affect ALL Muslims after violent incidents that involve, like, some people who just happen to be Muslims. SMACKDOWN: This one is just a variation of the first one (gutless hypocrites are very unoriginal thinkers). The smackdown is: So you’re saying it’s wrong to discuss actions that would affect ALL gun owners after violent incidents that involve some people who just happen to be gun owners? SMACKDOWN: Yes you CAN shout “fire” in a crowded theater IF THERE’S A FIRE! Even if it APPEARS there is a fire (excessive smoke, etc) you have a responsibility to speak out so other theatergoers are made aware of the danger and can take appropriate action. Cowardly apologists for Islam act like Muslim violence is purely hypothetical and that there’s never been any real-world violence from Muslim fanatics. GUTLESS HYPOCRITE COMMENT: Dude, are you, like, implying we should commit certain acts against Muslims? SMACKDOWN: Nope. Cowardly enablers of Muslim violence always act like the only two options are: 1) Do and say and write absolutely NOTHING about Muslim intolerance or 2) Wage all-out war. If people in the Western Democracies would start verbally holding Islam as accountable as other faiths for its homophobia, misogyny and other forms of intolerance the message might get through with no need for any violence. Here at Balladeer’s Blog I often get asked why I criticize both American Liberals AND American Conservatives. American Liberals are usually the ones who are stunned that other people don’t share their high opinion of themselves. That makes it as much fun to puncture the pomposity of American Liberals as it always was to lampoon holier-than-thou Christian Conservatives. *** AMERICAN LIBERALS ARE BIGOTS WITH SELF-CONSTRUCTED HALOS: The hilariously pretentious asses of American Liberalism have AT LEAST as many prejudices and bigotries as anyone else ever has but they go around convinced that they are THE moral models for the rest of the world. What’s even funnier is when the cowardly hypocrites who now call themselves Liberals try to take credit for the past accomplishments of courageous people. I mean the kind of courageous people who took stands when they faced genuine danger for doing so. American Liberals are gutless wonders who try to act like they would have had enough backbone to openly oppose the Nazis or 1950s blacklisting. No, “Liberals,” it’s pretty clear that you would NOT have been brave enough to do so. Right now you have the opportunity to openly oppose the violence, homophobia and misogyny of Muslim fanatics but you’re too cowardly to do so. Instead of speaking out about those modern-day versions of Nazis you ally yourselves with them, especially the repulsive Liberals of the “academic” (LMFAO) world who seem willing to be Kapos for Islamofascism.